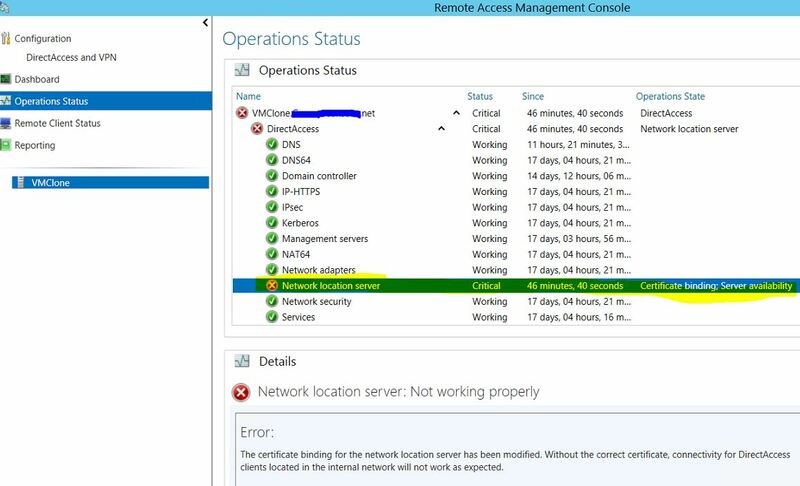 Resolving Windows Server DirectAccess Network Location Server DNS Scavenging Issue. | Chinny Chukwudozie, Cloud Solutions. ← Configuring Azure Site to Site VPN to my On-Premise Infrastructure using the Azure Classic Portal. A few weeks after deploying DirectAccess in my infrastructure environment, I encountered an issue where DirectAccess stopped working . My first step was to check the Operational Status of DirectAccess in the Remote Access Management console of the DirectAccess server. The Network Location Server status was flagged as Critical as indicated in the screen shot. Ping request could not find host directaccess-nls.mylab.net. Please check the name and try again. I opened the DNS console and couldn’t find the the DNS record for the NLS record. The record was deleted because I have DNS scavenging turned on in my environment. To resolve this issue, I ran through the DirectAccess Server Infrastructure Server Setup wizard. After running through the wizard, I clicked Finish to apply the changes and create the Network Location Server DNS name automatically. 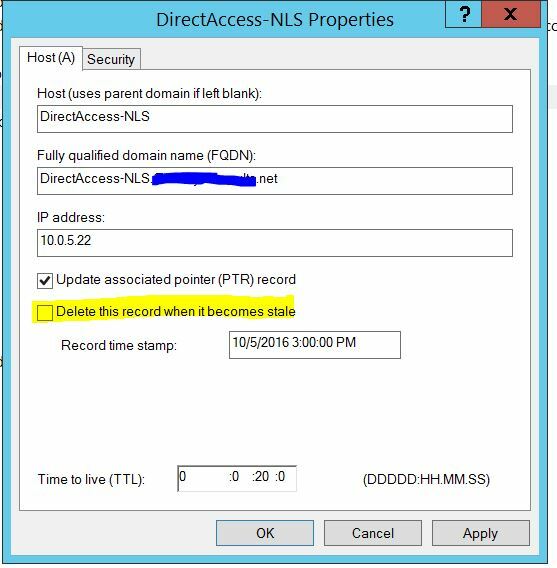 After confirming the DNS name was created successfully in the DNS console, right click on the NLS record and select properties to turn off “Delete this record when it becomes stale” . Click apply and Ok . This step should prevent DNS Scavenging from removing the record at the next aging cycle. I hope someone finds this helpful as it helped me. This entry was posted in DirectAccess and tagged DirectAccess, DNS, Network Location Server Error, Remote Access Management, Windows Server 2012 R2. Bookmark the permalink.